Red and white became a very popular colour combination from about 1880 – 1920 following the development of Turkey Red, the first reliably colour-fast red dye. 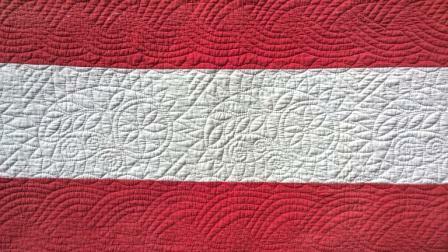 On this large, striking strippy quilt (214cm x 230cm) there are nine strips alternating between red and white cotton fabric. 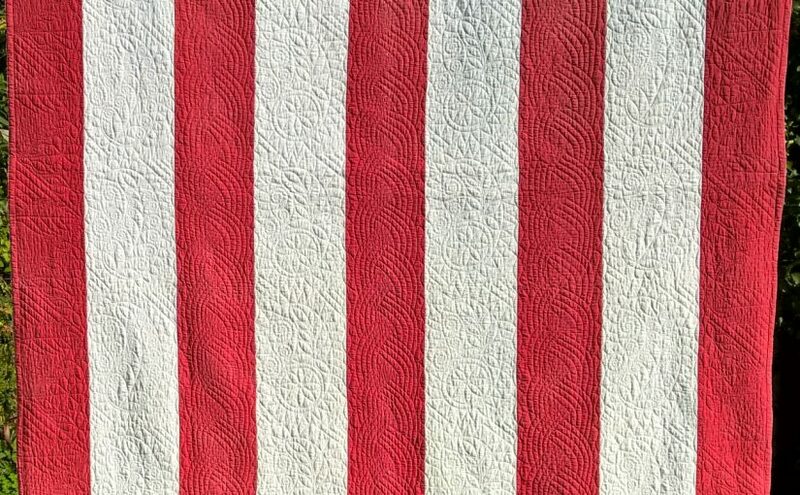 The back of the quilt is plain white cotton. The quilting designs are uncommon, including two variants of an unusually elaborate paisley motif. These paisley motifs are very large (14” high), with six repeats along each white strip. On the two most central white strips, the paisleys have an encircled eight pointed flower in the rounded end, with a sprig of leaves filling the upper body of the motif. A flourish of three spirals cascade down from the paisley tip, and the whole motif is outlined with “dragons teeth” formed from elongated triangles. On the two white strips towards the outer edges, the paisley still has the spiral cascading from the tip, but the outer edge is surrounded with rounder ended petals rather than the sharp triangles. Seven pairs of fern-like curling spirals spring from a central vein down the centre of the paisley. 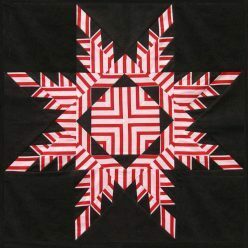 A broad four-stranded plait runs down the three central red strips, while the outermost red strips have a more complex design repeat of leaf and flower motifs facing inwards, within interlocked triangular sections. The filling is thin cotton wadding, and the hand quilting, in white thread throughout, is small and even. The butted edge is finished with a line of hand stitching, and a final line of machine stitching. 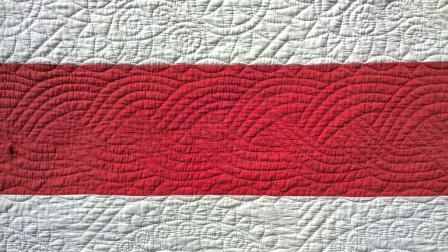 There is sporadic wear down the centre of the quilt, slight overall fading and one small repair. 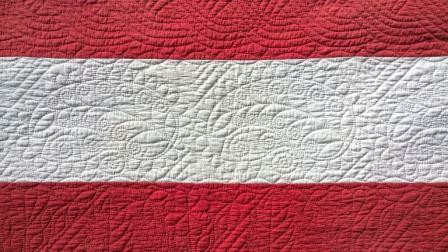 Generally however, the quilt is in remarkably good condition. 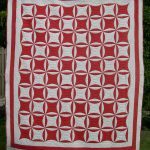 It was bought from a seller in Berkhamsted, Hertfordshire, who had no information about its provenance – as this is not a region with a history of quiltmaking at that time, it is fairly improbable that it was made in that location. Lilian Hedley includes a flat-iron and a large leaf motif with similar leaf, flower and tendril fillings in her first book of Traditional North Country Quilting templates, so on balance I would consider its origins more likely to be North country than Welsh, despite the spirals, given the general style, light weight and machine finished edge.